OLD Ma Necessity has come for an extended uninvited stay in the wake of the Fukushima nuclear accident and the subsequent idling of most of the country’s nuclear power plants. That’s spurred some inventive Japanese scientists to attack the problem of renewable energy power generation. One of the most ambitious plans is part of a project now being conducted by a team led by Kyushu University Prof. Oya Yuji in Hakata Bay, off Fukuoka Prefecture. They’ve developed what they call a lens windmill whose design triples the amount of power a conventional windmill can generate. In Stage One of the project, which started last December and will run for a year, the two 3 kW lens windmills shown above have been placed on a floating platform with solar power cells and a large storage battery. They’re calling it a floating maritime power farm. 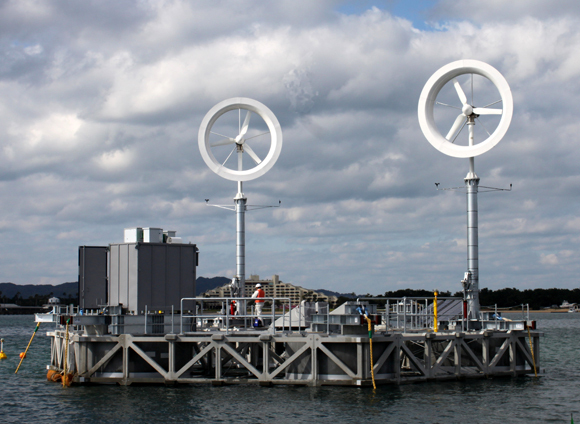 They plan to eventually add equipment that generates power from tidal currents and waves. Prof. Oya thinks the lens windmills would be practical if they could be made larger. One of the advantages of maritime windmills is that the wind is stronger over the sea. Also, renewable energy power generators require a large surface area, and Japan has a limited amount of surface area for equipment of this type. They’ve got plenty of sea all around them, however. Stage Two of his project is to place an interconnected floating platform in the Korean Strait with five 200 kW lens windmills. His team is already working on a design for 1,000 kW models. An intriguing aspect to the plan is the idea of using the platforms as small fishing ports. Sweden and Denmark both operate maritime windmills, and they’ve discovered that fish like to hang out nearby for reasons that no one can explain. Fishermen are unanimous in their belief that this is an excellent idea for an experiment. There are even suggestions that fish farms could be created below the platforms. Several problems remain. One is that the production costs for the lens windmills have to be lowered. Another is the space requirement. Even when commercialized, it would require 230 windmills to produce the output of the #1 generator at the Fukushima plant alone. Several companies are working with the Okinawa Prefecture Deep Sea Water Research Center in Kumejima-cho, Okinawa, on an ocean thermal energy conversion project that will run until next March. The idea is to use the difference in the ocean water temperature at the surface and that at greater depths. A temperature differential of 20 degrees (I assume centigrade) is required for this to work, so that means the tropics and the subtropics are the ideal location. That’s Okinawa! In this process, the difference in water temperatures is used to gasify ammonia and other substances with low boiling points, which rotates a turbine. The power output is only 50 kW, but this is a trial, after all. The center says it is the world’s first trial using this process with the objective of commercialization. They’re ready to go commercial at a ryokan, or Japanese-style inn, in the hot springs resort town of Yufuin, Oita. Starting in December, the ryokan will use a 70 kW generator that Kobe Steel put on the market last fall to generate electricity using the hot springs on the site. Not only do they expect to cover their own energy needs, they also plan to sell the surplus power generated to Kyushu Electric Power under the system for the sale of renewable energy at a fixed cost that began in July. Kobe Steel says that if the power is sold at 20 yen per kW, the ryokan could recover the costs by 2015. That highlights another problem with these systems. It costs Kyushu Electric JPY 10 yen per kW for the power generated by nuclear plants. These costs in the aggregate will be passed on to the utility’s consumers. In other words, the government scheme amounts to a renewable energy tax. And they’ve already gone commercial throughout Japan in the use of processed sewer sludge — yeah, that — as a biomass fuel for power generation. Kumamoto City plans to commercialize an operation in 2013, and Kitakyushu is planning to do the same in 2015. Construction work started on the plant in Kumamoto City in January. When it begins operating next January, it will have the capacity to process 16,000 tons of the sludge, roughly half the amount produced in the city. That will be converted to 2,300 tons of fuel for use at power plants. Here’s an idea: Create smaller models of this equipment and place them in the buildings that house national and sub-national legislatures. We wouldn’t have to worry about nuclear energy or lens windmills again. Seeing as how Okinawa came up in the discussion, here’s Okinawan Natsukawa Rimi singing an island song. This entry was posted on Sunday, August 26, 2012 at 5:30 pm	and is filed under Science and technology. Tagged: Fukuoka, Japan, Kumamoto, Oita, Okinawa. You can follow any responses to this entry through the RSS 2.0 feed. You can leave a response, or trackback from your own site. A: Sorry, I am not sure what is meant by “old Ma” necessity…is it 間? or 魔?…. 2: It’s an attempt at a joke, based on the English expression, “Necessity is the mother of invention”. That’s also the expression from which Zappa got the name for his first group.